The Intern spent last weekend taking Poinsettia down to Living Records, since he’s recently gotten involved Scott Castella has bought the place from his uncle and has been running it for the last twenty years. The influx of students involved in vinyl and some of the rarities that Living Records collect keep the store in business. Vinyl records are an undead format, much like the Zombies that we celebrate during Zombie Awareness Month. This time, our Tuesday uEtsy spotlights Jenn Rose FX and her store that offers not records, but other bits of evidence of things living and dead. The above piece, “Walk,” demonstrates the mobility (or lack thereof) of the typical recently reanimated. Or, the fashion sense of a typical slobbish undergrad. One must be careful when traversing a University campus during an outbreak since it’s hard to discern a sluggish BioChem major from their term project. This isn’t meant to discredit Ms. Rose’s work. 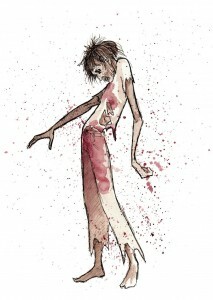 Here, in this minimalist expression, she manages to convey motion and the abnormal structure of the subject’s anatomy. With just a few thoughts, anyone looking at the picture could easily reproduce the subject’s wounded gait. It’s that level of understanding which is commendable within her work. The depth of expression contained in the one good eye of the subject in “Stare” is astounding. 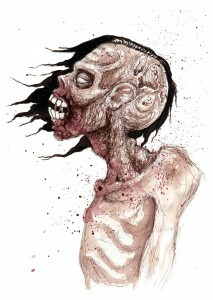 The lack of humanity and bare, animal reaction to the environment is, coupled with their overflowing horde mentality, what makes a zombie scary. Adding some pensive reflection is an interesting choice. If you were to cover up the good eye of the character, what expression do you see? A malevolent being about to jump at you to get his next meal? Cover up the mouth, its lips pulled down in a terse expression, and do the eyes reflect a sense of sorrow? 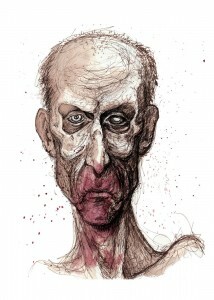 Add all the elements and does this creature appear to contemplate you or perhaps, consider your reaction to its visage? Is that the source of its disgust or the act that it must do next? Things to consider. 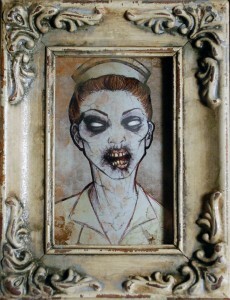 A more modern rendition of the undead has this zombie nurse with decayed mouth and dead eyes. It comes with a frame whose hand-painted accents complement the subject. If you wish to have a ghoulish metaphor for the current health care system in your country, this would be perfect. Not only are there pictures, but other object for sale from Ms. Rose’s designful mindful. 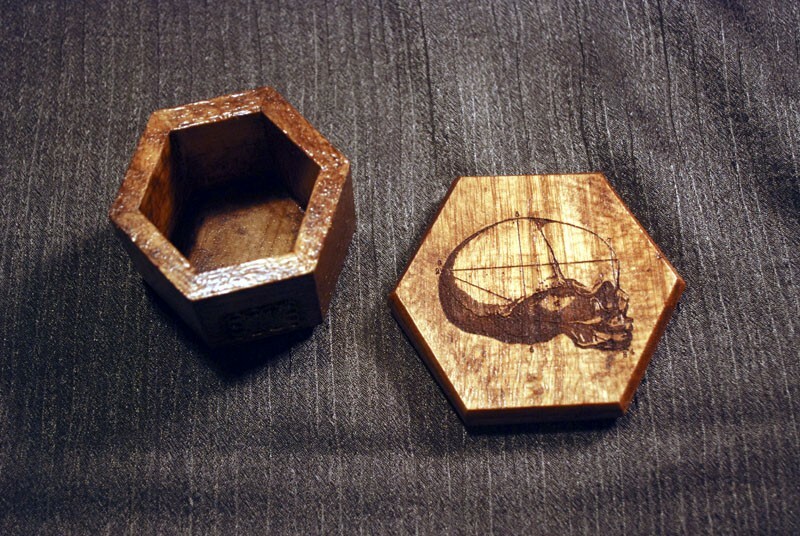 This trinket box displays the anatomic skull of an infant, a reminder of the potency of a child’s mind and how it’s carried within such a small case. 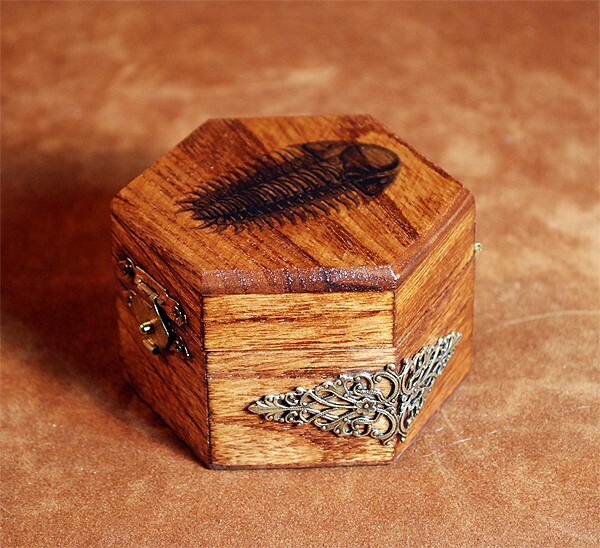 Similarly, you can keep all your magnificent treasures inside a box, showing that a lot can be fit inside a small box. 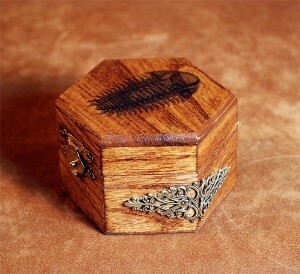 Of course, if natal-skulldergy is not your thing, Ms. Rose offers a variant that features a trilobite. Bring about the fossils and show that nothing is ever truly dead. A fantastic saying to keep in your mind when you open it up to find those mementos you keep, those physical objects that store your memories as you swish about through your life. You can find Ms. Rose’s work here at her store, on Facebook and even on Twitter. Follow, like and buy – not necessarily in that order and not in that specific quantity (just make sure you BUY more than you Follow.) And follow the line back here to Tuesday uEtsy next week. See you then.